The DC Extended Universe has delivered some good movies like Wonder Woman and Aquaman over the past few years, but the Warner Bros. superhero franchise has also been largely hit and miss, often struggling with consistency and tone. Now Shazam! is here to inject a much needed jolt of energy into the DCEU, and it’s not only the most enjoyable and strongest overall film yet in the series, but it also puts the studio toe to toe with their rivals at Marvel. The film follows Billy Batson (Asher Angel), a 14-year-old foster kid who keeps running from foster home to foster home, trying to track down the mother (Caroline Palmer) he got separated from years earlier. He finally gets placed with Rosa (Marta Milans) and Victor Vasquez (Cooper Andrews), a foster family in Philadelphia, where he initially struggles to fit in with their pack of kids. When Billy hops on the subway following an encounter with a pair of bullies at his new school, he gets transported to a cave, where an aging wizard named Shazam (Djimon Hanson) bestows powers upon him. 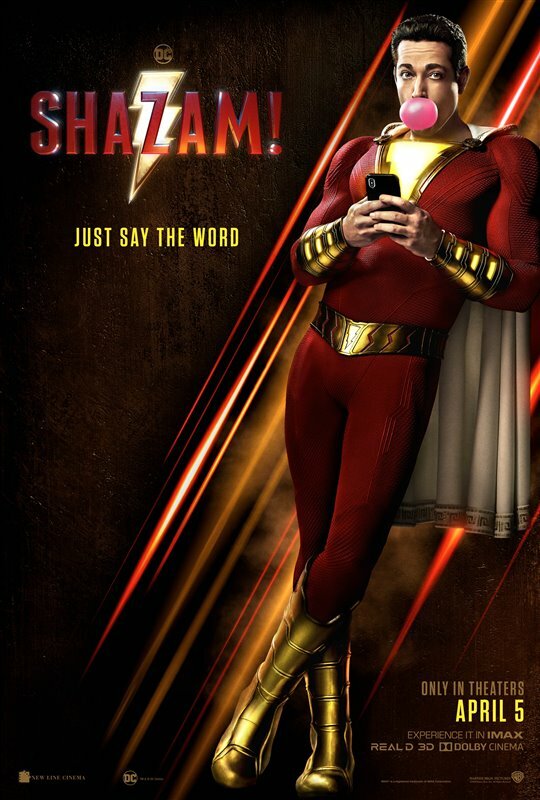 Every time Billy says the word “Shazam,” he morphs into an adult-sized superhero (Zachary Levi) with a variety of powers that would make any other hero jealous, ranging from electricity that flows through his fingers, to “bullet immunity” and even flight. With help from his disabled foster brother Freddy Freeman (Jack Dylan Grazer), who happens to be obsessed with superheroes like Batman and Superman, the teenaged Billy starts to play around with his powers, and embrace his newfound identity as a grown up superhero. But it’s not long before he has to prove himself truly worthy of his new powers, by going up against the supervillain Dr. Thaddeus Sivana (Mark Strong), who is desperate to gain these powers for himself, and has a horde of demons that he is able to conjure up, which are each modelled after one of the seven deadly sins. Directed by David F. Sandberg, fresh off the horror films Lights Out and Annabelle: Creation, Shazam! is simply a ton of fun. The premise of a kid ending up in an adult’s body draws obvious comparisons to Big – there’s even a nice throwback to the Tom Hanks classic during a fight in a toy store – and there is a sense of playfulness to the film that makes it a blast to watch. A great example of this comes during one of the best sequences, a ridiculously fun training montage set to the Queen song “Don’t Stop Me Now,” where Billy and Freddy test the limits of his powers by creating a series of viral videos. The film finds the perfect sweet spot between feeling like a knowing satire of superhero movies, while also being a sincere and wildly entertaining addition to the genre in its own right. It’s filled with winking humour and is often laugh out loud funny, but the film’s dramatic core is also quite effective, offering a touching and at times surprisingly emotional story about family and the fear of abandonment. Zachary Levi is super charming in the leading role, essentially playing a kid trapped in an adult’s body, and his winning performance is a big part of the film’s success. Jack Dylan Grazer steals every moment, delivering some disarmingly funny one-liners while also allowing us to feel the pain of what it’s like to be an outcast who is desperate to fit in. The two actors have a great rapport between them. Asher Angel also deserves praise for his strong portrayal of the younger version of Levi’s character, with both performers complimenting each other quite nicely. I really enjoyed Shazam!, and the film is honestly just so much fun to watch that I think it might be somewhat of a new classic. It’s really funny, has good action scenes, and also a lot of heart. It’s a winner through and through, delivering exactly what you want from a comic book movie, while offering a great example of blockbuster filmmaking at its most unabashedly enjoyable and gleefully entertaining. The fact that the film was almost entirely shot in and around Toronto adds another level of enjoyment for local audiences, who will instantly recognize many of the settings and TTC vehicles, despite the fact that our city and transit system have been dressed up to look like Philadelphia. Shazam! is now playing in theatres across Canada.